The first Admiral custom Classique 35 metre superyacht Foam has recently been delivered to her owner by the Italian Sea Group. 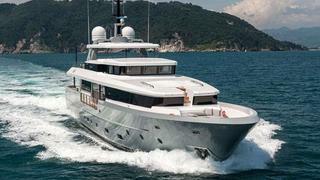 The full displacement motor yacht Foam was launched in May 2014. She is a fully custom built, designed by Admiral's in-house design time Admiral Centro Stile, which gave her a traditional meets modern design. She has traditional lines with a raised pilothouse design, but she has a sleek, modern profile thanks the expansive windows on the main deck and the bold grey hull that contrasts with the clean white superstructure. At mid ship, the bulwark is lowered to accommodate a panoramic balcony off the main saloon. The saloon also features full-height windows to let in plenty of natural light. Her sun deck is one of the largest for yachts in her class, and superyacht Foam also boasts a beach club for outdoor relaxation. Interiors are also custom, featuring bespoke joinery and furnishings, leather and stainless steel details. Guests are accommodated in three spacious staterooms. Meanwhile, crew accommodations are split between the lower and main decks, with the galley and crew mess found forward on the main deck and three crew cabins, including the captain's cabin, located below.